This weekend we are being offered two very different visions of Manchester. One offers HOPE, another hate. Our Manchester is a city of vibrancy, tolerance and friendship. The other is being presented by the English Defence League and is a Manchester of hatred, intolerance and violence. Combating extremism and hatred from the EDL and BNP in our community, on our streets and in our schools is crucial. We need to stand together to celebrate what makes Manchester a unique and vibrant city; something the EDL and the BNP want to tear apart. HOPE not hate will be central to that celebration. We have great plans over the next few years to bring our community together. Working with the City Council, faith networks and community organisations we will be holding events that bind together what we all have in common, celebrating the city and the people who make it so special. Called TOGETHER, we will celebrate the diversity and brilliance of Manchester but we will also seek to celebrate what we have in common and build a new shared identity in which everyone has a place. We will use food, culture and the strength of our own personal stories to bring us together. 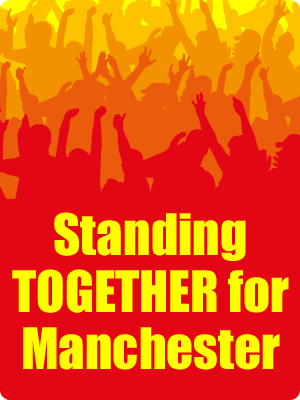 On the eve of the EDL’s event, HOPE not hate will be supporting a vigil at Manchester Cathedral this Friday where people from across Manchester’s communities will stand shoulder to shoulder against the people that would see us divided. Opposing the EDL is not about the one day of street protest, as important as that is, but sustained work over time in local communities that will make a tangible and lasting difference to ordinary lives. This is what the TOGETHER campaign is seeking to do. As a HOPE not hate supporter, I’d dearly love to invite you to join with me to reject the politics of hate and make Manchester a better place. Hope not Hate is an anti-racist and anti-fascist campaign backed by many trade unions and community groups, and supported by the Daily Mirror and many other organisations and individuals.